The Institute for the Study of Societal Issues is pleased to announce a call for applications for the Graduate Fellows Program (GFP). In its forty years of existence, the Program has provided an interdisciplinary research and training environment as a complement to, and resource for, graduate programs in the social sciences and professional schools. Over 150 graduate student fellows have successfully completed their doctoral studies and gone on to carve out distinguished academic careers that have significantly influenced their respective disciplines and fields on contemporary issues of social stratification and inequality. In an expansion of this Program, the Joseph A. Myers Center for Research on Native American Issues will provide funding during the 2019-20 academic year for one or more UC Berkeley doctoral student who is in good standing and has completed at least three years of graduate studies and whose research concerns issues confronting Native Americans in the United States today. We are looking for promising applicants who can benefit from the additional training and mentoring offered by our program and who are committed to doing research to advance social justice or social change in Indian Country. Students from groups historically underrepresented in higher education - especially Native and Indigenous students - are highly encouraged to apply. The Center is especially interested in supporting community-based research involving Native communities in the areas of health, safety, and governance. In addition to receiving monthly stipends, Graduate Fellows enjoy access to a rich array of activities that promote mentoring relations with faculty, collaboration with peers, and the exchange of ideas with a broad audience of academic and community leaders. The GFP offers doctoral students the opportunity to work in an intensive, small-group setting on issues of common interest. Fellows from a range of disciplines support one another’s research, make presentations at conferences and colloquia, and publish working papers. The GFP creates the conditions for forging successful scholarly careers and assuming positions of intellectual leadership in the professoriate. The unique strength of the program is that it is built around the skills, work, and insights of its graduate student participants. It is organized around and depends upon the collective intelligence of each Fellow in the cohort working together to produce and share work as well as critiques and reflections on the work of others. The program has developed and changed over time, but the foundations are anchored in two understandings: 1) Financial and individual support, alone, are not adequate to help Fellows develop their research and writing skills and to hone them for success in getting publications and preparing for jobs and other professional objectives; 2) The program works by binding individual financial support with the practical skills, knowledge, and motivation that come from doing research and writing in a shared and collective setting; learning how to research and write is integrated with and inseparable from being readers, listeners, and active critics and supporters of the other Fellows’ research. Using these training techniques, the Graduate Fellows Program has enjoyed an unparalleled record of success. The Program has enabled more than 150 students to complete their doctorates and carve out distinguished academic careers. The Program is uniquely situated to nurture the next generation of leading scholars. Berkeley’s graduate programs attract the best and the brightest faculty and students, and the campus is home to an astonishing number of top-ranked departments. As a result, the Graduate Fellows Program can bring together students of the highest caliber across a range of disciplines and link them to faculty who are doing groundbreaking research. Many of these students come from diverse backgrounds, and the problems that they study are not simply abstractions but are grounded in their own experience. This program is supported with generous funding from the San Manuel Band of Mission Indians. The Institute for the Study of Societal Issues serves as the research and teaching base for the Graduate Fellows Program. Fellows attend a weekly two-hour seminar* in which they receive practical training in theory, methods, and policy work. The core emphasis is on field research and the production of scholarly work geared towards a broad understanding of the patterns of social change. The training draws on insights from a wide array of fields, including sociology, urban anthropology, political science, urban and regional planning, geography, education, history, public policy, law, social welfare, and public health. In order to be responsive to the specific needs of students at different stages in their graduate careers, the program is designed to span two years. During the first year, the focus of the training program is on the development of a working paper based on dissertation research. Fellows receive training in selecting and framing a research problem, situating the research within the relevant scholarly literature, choosing the appropriate research approach and methods, conducting preliminary research, and drafting a research working paper. Papers are drafted by the end of February and completed by the end of the academic year, after which they are added to the California Digital Library, the University of California’s “eScholarship Repository.” In addition to regular attendance at weekly seminars, Fellows are expected to provide and receive critical feedback on other Fellows’ works in progress; and be active and contributing members of an interdisciplinary community of young scholars. In the spring semester, first-year Fellows make a public presentation of their working papers at an ISSI-organized colloquium, panel or conference. The presentation provides an opportunity, in conjunction with development of the working paper, to receive feedback and build skill at crafting a rhetorically and academically effective documentation of one’s research. Graduate Fellows who are active program participants and successfully complete the requirements during the first year (i.e., regular attendance, completion and presentation of a research working paper) are eligible to apply for a second year as a Fellow. 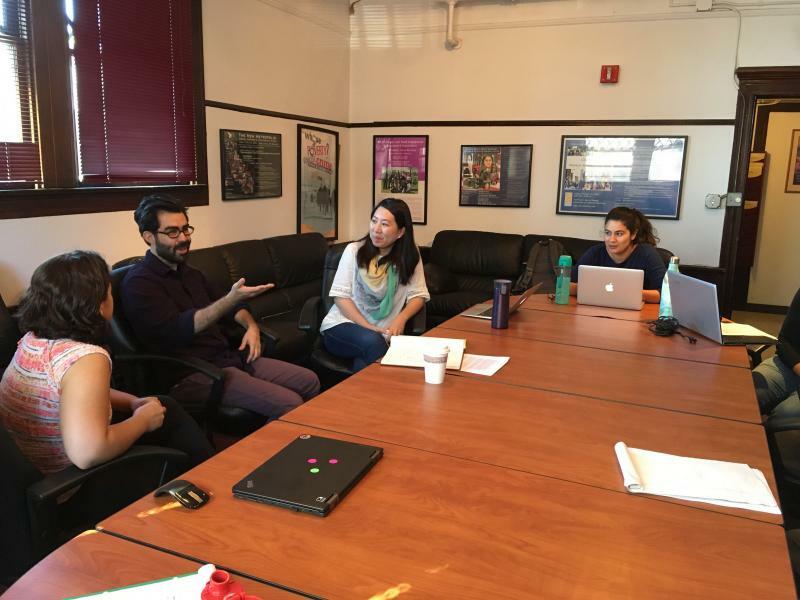 During the second year, Fellows continue to meet weekly to present and receive constructive feedback on their individual research and writing projects and skills training in professional development to prepare them for the academic job market. They also work with Institute staff to plan a spring colloquia series featuring social change scholars whose work is of interest both to the fellows and to the wider campus community. Please note that while it is a two-year program, at this time we do not have funding for stipends for 2019-20. We hope to obtain additional fuding by the fall 2019. Throughout the two years, Fellows are eligible for office space at ISSI to facilitate their research and writing. The mentoring and networking that are part of the GFP continue beyond the two years of the formal program and the Fellow’s graduate studies, often extending into their first years as an assistant professor. *NOTE: Before each semester begins, Fellows select a convenient day and time to meet on a weekly basis. If it is unlikely that your schedule will be flexible enough to accommodate a weekly meeting, you probably should not apply. Participation in the GFP requires a substantial time commitment equivalent to taking a course. Only registered UC Berkeley doctoral students who have completed at least three years of graduate study by May 2019 are eligible for this program. For questions or additional information please call Dr. Christine Trost at (510) 642-7237 or email inquiries to: ctrost [at] berkeley.edu. Please send your application materials and a letter of recommendation from your faculty advisor to: Dr. Christine Trost, Joseph A. Myers Center for Research on Native American Issues, Institute for the Study of Societal Issues, 2420 Bowditch Street, MC 5670, University of California, Berkeley, CA 94720-5670. Stage 1: Applications for the Graduate Fellows Program are due at the ISSI Front Office, 2420 Bowditch Street, Berkeley, CA 94720-5670 before 5PM on Monday, April 1, 2019. Applicants will be notified by Monday, April 22 whether their application has been selected for the second and final stage of the selection process. Stage 2: Applicants who have been selected for the second stage will be provided with critical feedback on their research statement. The second draft of the application is due Monday, May 13 by 9am. Applicants will be notified by Friday, May 31 if they have been selected to join the Graduate Fellows Program. We are conducting a workshop for all graduate students interested in applying for the Graduate Fellows Program either this year or in a future year. Attending the workshop is not required.